You are here: Home / Google / New Version of Gmail? Google Blogoscoped is reporting that they see a link to Newer Version in Gmail. I checked my account and i don’t see anything as of now. They also published some screenshots of this new version. This new version seems to be faster than the old one and it has a better contacts manager. 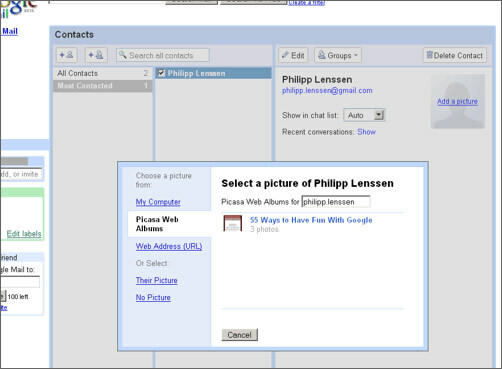 When you add a picture for a contact, you can pick a file straight from Google’s Picasa Web Albums. Skipping the hard disk might seem like no big deal but we may see more and more of this in the online OS/ online office. Update: Gmail blog has posted an official response. Cool! the new Gmail is soooo sleek! I too don’t see this new version of GMail that you’re referring to, but those screenshots of yours look a lot to me like the new G Sitemaps. I too dont see any new version, may be available to selected users. I havent seen it yet . Lets hope everyone gets it soon.